These are the most common type of compressor. They can be either stationary or portable, can be single or multi-staged, and can be driven by electric motors or internal combustion engines. Reciprocating compressors are typically used for short term or intermittent duty and are commonly seen in automotive applications and panel and paint shops. These compressors use two meshed rotating positive-displacement helical screws to force the gas into a smaller space. 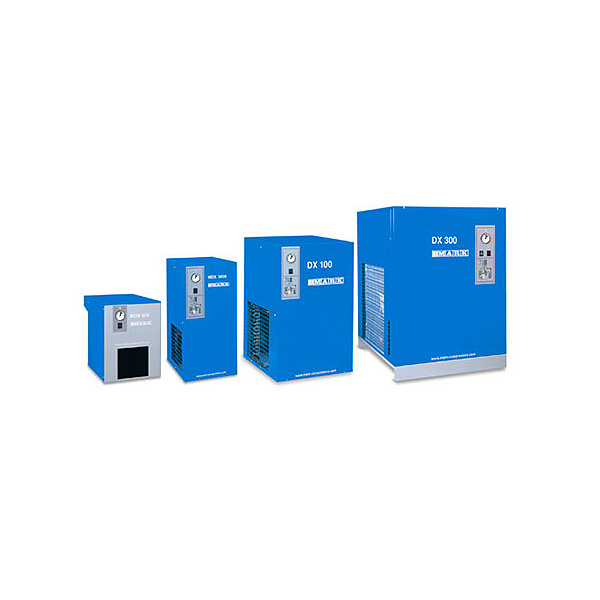 These are usually used for continuous operation in commercial and industrial applications and may be either stationary or portable. Installing an inverter-driven screw compressor can assist in achieving further reductions in compressed air related energy costs. Although some climates are more humid than others, there is always water vapour present in the atmosphere. As ambient air is compressed, this vapour often then condenses into water droplets. Again, with basic applications and machinery this needn’t be a problem. With sensitive equipment, however, prolonged exposure to moisture from your air compressor can cause severe damage. The most effective solution to this problem is the use of an additional drier. Driers can be purchased separately and fitted to most compressors but also come as standard with many of our industrial air compressors. Like most machinery, air compressors need oil to lubricate their moving parts. Given that the act of compression requires the air to come into contact with at least some of these moving parts; it is not uncommon for the compressed air produced to have traces of lubricating oil present in it. If you are simply using pneumatic tools then this needn’t be a problem, as they are likely to be tolerant of some oil in their air supply. However, in medical applications for instance, this would be unacceptable. You have the choice of applying a filter to a regular air compressor or purchasing an oil-free compressor. The range of filters we supply eliminate oil particles up to a degree of residual oil equal to 0.01mg/m3. Noise issues are becoming an increasing concern for business owners and whereas it is possibly acceptable for a mechanics’ garage to be a noisy place, the same level of noise would be absolutely unacceptable adjacent to an office or residential area. As such, it is important to consider the noise that your air compressor is likely to make and how, if necessary, to minimise it. Due to their design some air compressors, especially rotary or screw compressors, are much quieter. When noise is a serious consideration then, it is wise to consider a screw compressor but you could also get around this problem by housing your compressor in another room or building, should you have the available space. The MARK range of rotary screw compressors is fully silenced, down to a minimum of 61dB(A). In addition to choosing the right type and capacity of compressor, other factors should be considered. Most air compressors should have an operational life of up to 15 years. Like most machinery, however, an air compressor’s lifespan will ultimately be determined by how heavily it is used and how well it is maintained. Accordingly take care to choose a compressor that can comfortably cope with its workload, taking into consideration any wastage and future needs, even if that means spending more on your initial purchase. An overworked compressor will need to be replaced or repaired sooner and could prove to be more expensive in the long run.